The first morning we were in Oranjestad, my friend Sue and I walked around the city. It was so cute and every turn had something new and unexpected. I loved all the colorful buildings and homes and this house was no different. 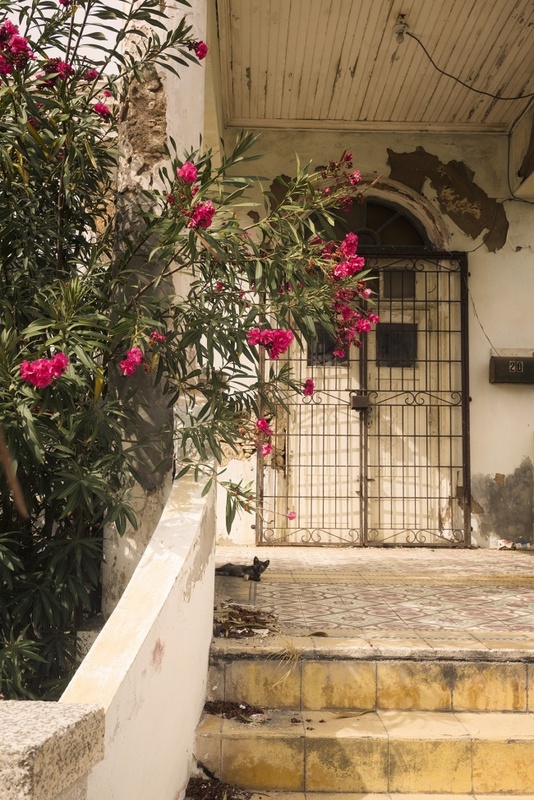 It was the pink flowers that originally drew me in but then it was all the cracks and tears all along the facade that really made me want to photograph the house. I just loved all the details and really wished that I was able to walk onto the porch but there was a gate blocking us from doing that. So I captured this image with my 16-35mm wide angle lens. As we were walking around more I felt like I wanted to capture more detailed shots of the house. I opened up my backpack, trying to dig out the 70-200mm when I noticed a cat was sitting on the porch! I had no idea it was there when I first took the picture so I tried to remain calm and quickly put my 16-35mm wide angle back on the camera before I went any further. I’m not sure what happened but the cat quickly got up and ran away 🙁 I was kind of disappointed that I wasn’t able to capture the cat like I wanted to but went back to review my images and I’m so glad I was able to capture this. It’s so funny because I didn’t even know he was there in the first place. He was a tiny little guy so I wouldn’t be surprised if you missed him the first time you looked at this image too. LOL. My camera settings for the image is F8 at 1/800th of a second at ISO 320 with my Sony A7II and 16-35mm wide angle lens. So yesterday was one of the best days ever! I’m still trying to comedown from the high. Andrew and I attended the Ball for the Mall and it was the most beautiful, exciting, and inspiring evening ever. Thanks again to the Trust of the National Mall for the invitation and using my images throughout the entire event. Everything was absolutely incredible. Promise I’ll share some images from the evening soon. I’m still trying to gather all my thoughts about the night. In the meaning time, here’s a pretty picture of the cherry blossoms 🙂 LOL. 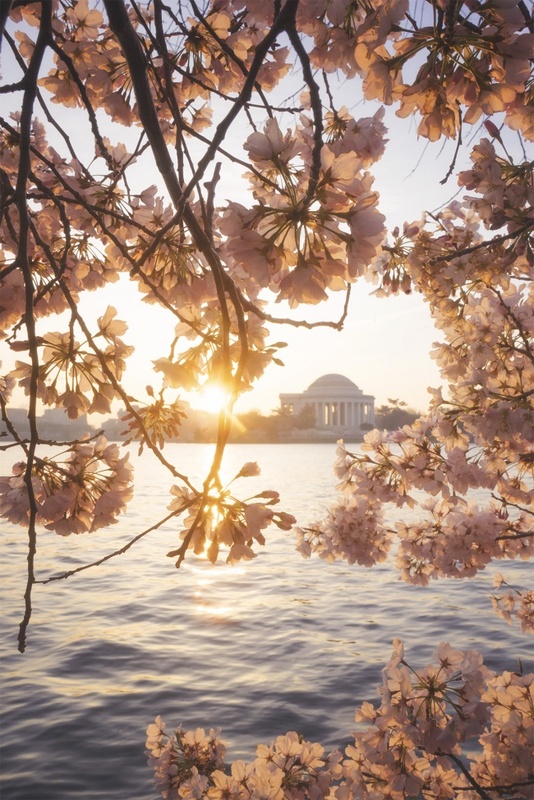 Like I said yesterday, I didn’t create too many images with the Jefferson Memorial and the cherry blossoms this year. I feel like it’s been done so many times that it’s difficult to make it different. So on that same day that I managed to shoot with very low battery, I grabbed this image. Initially it was the sun burst that caught my attention, but I’m a sucker for using the cherry trees to frame subjects. My favorite is the light that’s coming through the flowers. Doesn’t it make you feel all warm inside? This is why we need to help preserve the National Mall and other national parks across the country. So that people can appreciate beautiful scenes like this forever and ever. Government funding only goes so far. 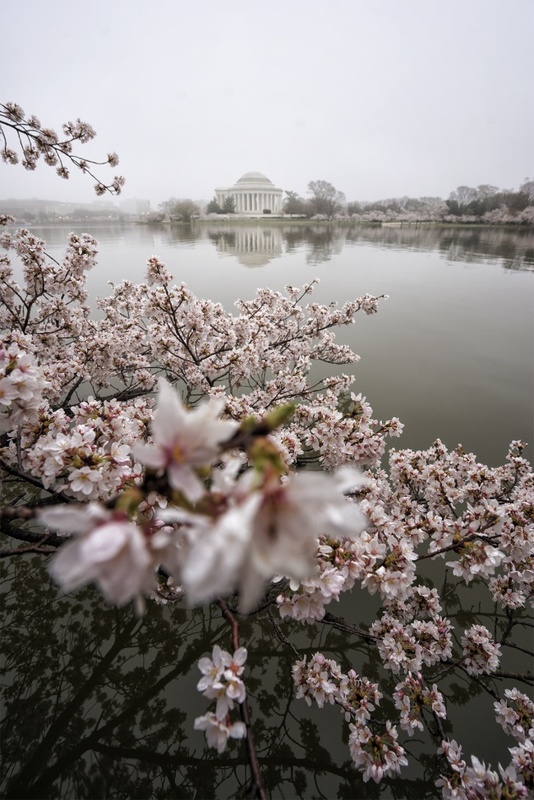 We need additional resources that will help keep the cherry blossom trees healthy and all of our monuments and memorials safe and clean. The National Mall is a unique national park because it’s located within a city. We get so much foot traffic that eventually things are going to wear and tear. Please click here to find out how you can help. My camera settings for this image is F22 at 1/100th of a second at ISO 400 with my Sony A7II and 27-70mm handheld. 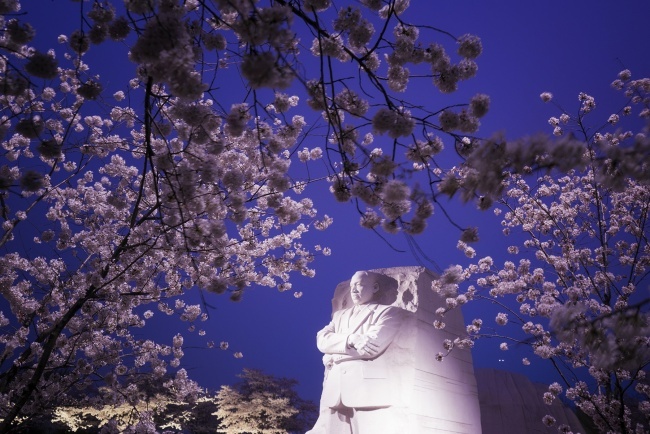 Another one of my goals this season was to capture the Martin Luther King Jr Memorial with the cherry blossoms. If I was going to be at the Tidal Basin, I wanted to try different things from what I typically do. Going back and looking at my images, I barely have any of the Jefferson Memorial and the cherry blossoms. So weird, right? Last year they were like peanut butter and jelly. This year it was like the Jefferson Memorial didn’t even show up to the party. I also realized that I don’t have very many images of the Martin Luther King Jr memorial in general, let alone with the cherry blossoms. So anytime I was close or even from far away, I was trying out different compositions. I was determined to get something I liked. My camera settings for this image is F5.6 at 0.6 seconds and ISO 500 with my Sony A7II and 28-70mm lens on my gitzo tripod. Finallyyyy a sunny day at the Tidal Basin. So far this cherry blossom season has been very cloudy, grey, and windy. Which isn’t necessarily a bad thing, but I prefer blue skies with my pink flowers. I think the color combination works so well together. So I was thrilled when we finally had clear skies and s-u-n. 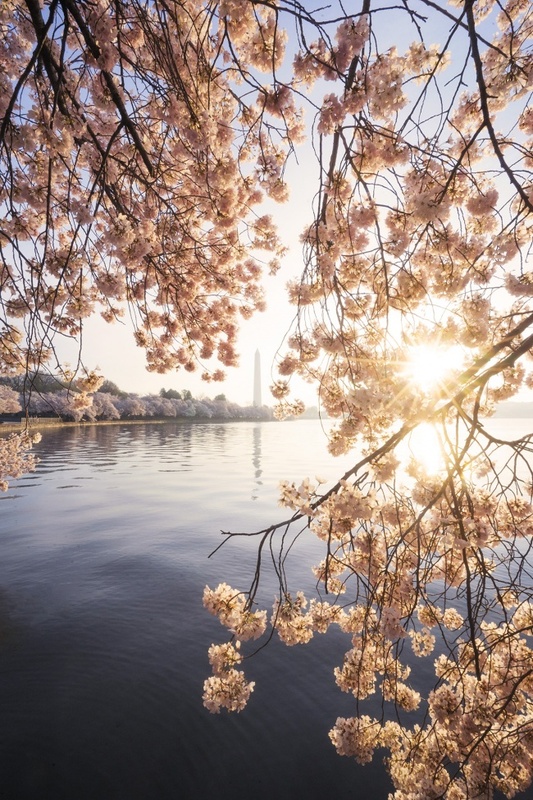 This particular day I was not planning on being at the Tidal Basin, instead I parked my car along Ohio drive and I had every intention of staying on Ohio drive and shooting the cherry blossoms along the Potomac river. That quickly changed because I thought I saw some fog coming off the Tidal Basin and you know me and fog. It’s like a magnetic connection we have. I ran over to the basin and saw nothing. It was probably some kind of mirage or wishful thinking for some fog and cherry blossoms but either way, I’m glad I ended up there. Once the sun actually came up, the light hitting the blossoms was amazing! I couldn’t have asked for a better lighting situation. I could have asked for a better battery situation because out of the 3 batteries I had with me, I only had enough charge for about 30 minutes of shooting 🙁 I was so upset when the first battery started flashing the warning because I knew I didn’t have much left on the other ones. How could I forget to charge them? Luckily I was able to squeeze just a couple of images at the very end of the battery life and came up with this image. 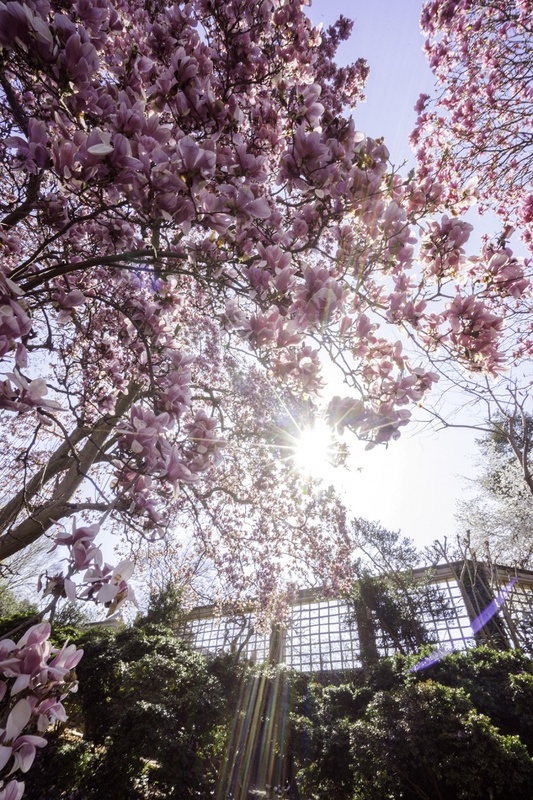 I love the sunburst peaking through the blossoms. I think the flowers underneath that are the ones that I look at the most. They look as if they’re glowing. My camera settings for this image is F22 at 1/125th of a second at ISO 400 with my Sony A7II and 16-35mm wide angle lens.